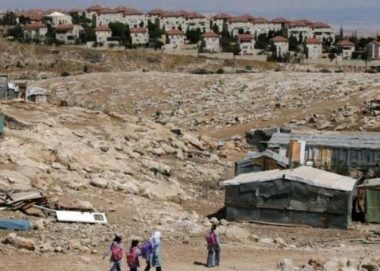 The Palestinian Center for Human Rights (PCHR) condemns the Israeli Supreme Court’s decision to demolish Khan Al-Ahmar Bedouin Community, east of occupied Jerusalem, and expresses its concern over implementing this decision at any moment by Israeli forces. PCHR calls upon the international community to immediately intervene and assume its legal and moral responsibilities to stop the implementation of this serious scheme that is in favor of the settlement activities in the occupied Palestinian territory (oPt). According to PCHR’s investigations, on Thursday, 24 May 2018, the Israeli Supreme Court Justices Noam Solberg, ‘Anat Brown and Yael Fellner, issued a decision that allow Israel to demolish the houses of Khan Al-Ahmar Bedouin Community, east of the city, and to transfer them from their houses to what is known as “Jerusalem Gate” in al-‘Izariyah village, east of the City. The demolition decision included all the Bedouin community houses, including a mosque and a school that were built of mud bricks and rubber tires. ‘Eid Khamis Jahaleen, Head of Khan al-Ahmar Bedouin community, said that he was informed of the court’s decision on Thursday, 24 May 2018. He also stated that the court held a hearing on 25 April 2018 to consider the challenge on the displacement decision. At that time, a decision was issued to give the Bedouin Community residents 10 days to find another place. ‘Eid Jahaleen expected the demolition and displacement decisions will be implemented at any moment. Khan Al-Ahmar Bedouin Community, which is near “Ma’ale Adumim” and “Kefar Adumim” settlements established east of Jerusalem, shelters around 35 families comprised of 190 persons who live in tin-plate houses and tents. Regarding the school, it is the only one in the community that includes around 170 students and 16 teachers. The number of the Bedouin communities, east of Jerusalem, is 23 communities where around 5,000 civilians live. This Bedouin area in East Jerusalem is one of those areas that have been targeted by the colonization for decades. The Israeli Government has unprecedentedly accelerated its settlement, particularly in East Jerusalem and its surroundings. On 16 November 2017, the Organization and Construction Department of the Israeli Civil Administration issued orders to evacuate the residents of Pope Mountain Community in al-‘Izzariyha village near “Ma’aleh Adumim” settlement. This community is inhabited by 57 families comprised of 320 members; half of them are children. In the same date, the Israeli Prime Minister issued a decision ordering the Palestinian Bedouins living in communities to evacuate their houses in the vicinity of occupied Jerusalem, near Street No. (1) and relocate them to the Dead Sea. The later Israeli Supreme Court’s decision came in favor of the settlement projects in that area. Believes that the conspiracy of silence practiced by the international community has encouraged Israel to commit further violations of international human rights and international humanitarian laws, including the efforts made to create a Jewish majority in occupied East Jerusalem.